During my last post, I discussed four foodstuffs—yes, that is a real word—from WD~50, and three of the items were from the tasting menu. 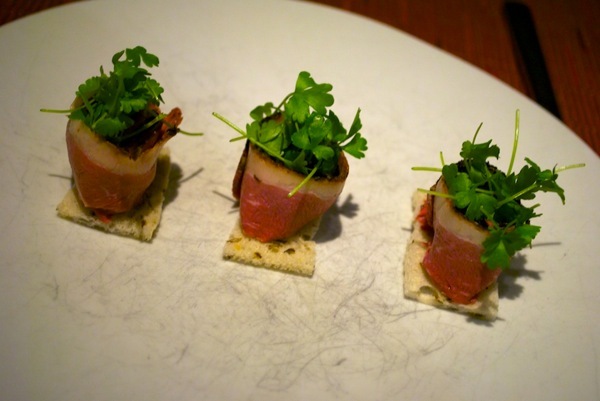 In this post, I will review the other eight items on the tasting menu in addition to the corned duck appetizer and Wagyu flap steak entrée, which I ordered as a tasting menu dish. 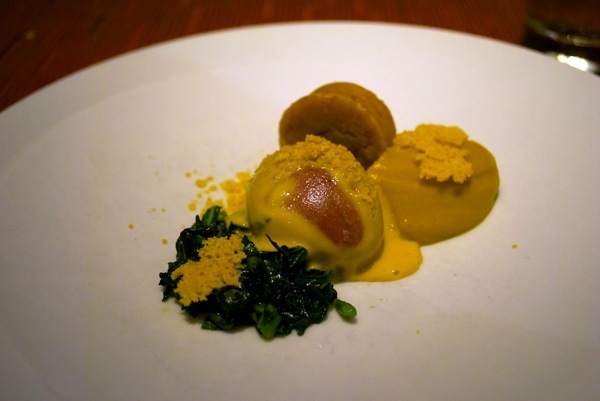 The scrambled egg ravioli dish was one of my most favorite dishes at WD~50. 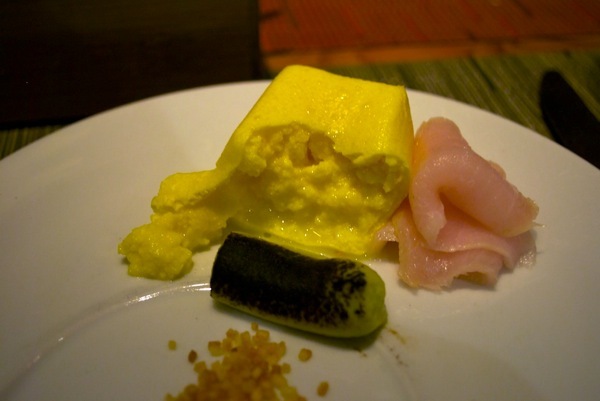 Scrambled egg is presented in the shape of a cube with a piece of kindai kampachi fish resting on top. A cylinder of creamed avocado with charring on the surface rests gracefully next to the egg and trail of tiny, crunchy potato bits. 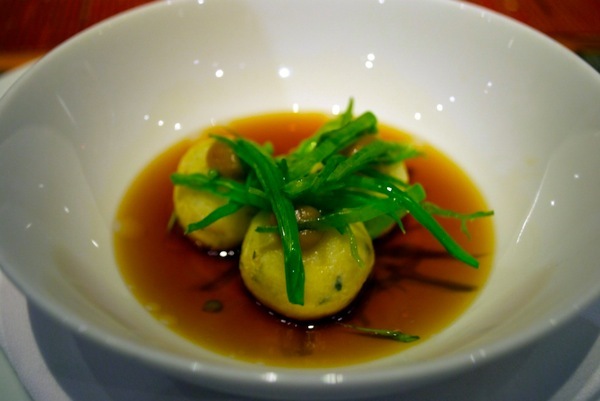 In molecular gastronomic cooking, large encapsulations of food are referred to as raviolis. 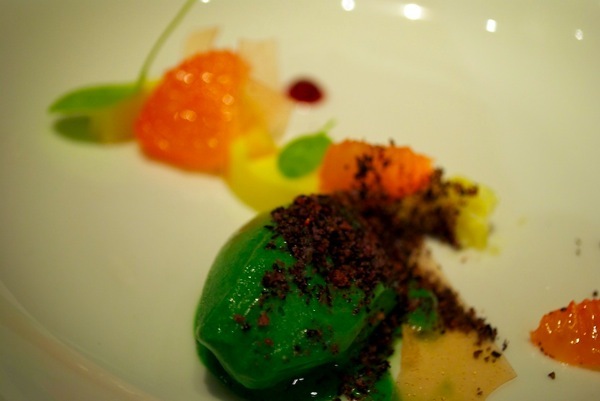 For example, I have created mango ravioli before, scoops of mango encapsulated by calcium alginate film. 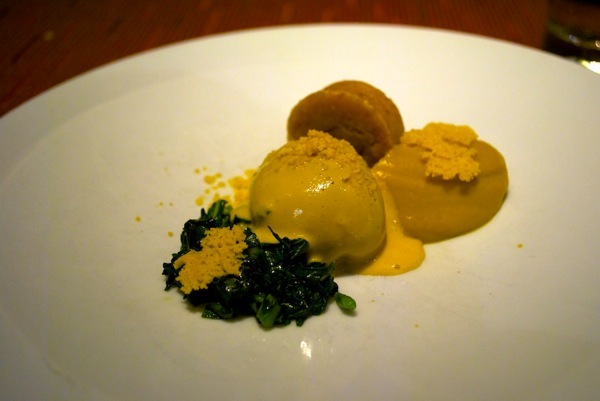 Here, Wylie Dufresne encapsulates perfectly cooked scrambled egg in well cooked scrambled egg. Basically, the outside of the ravioli is hard scrambled egg while the inside is soft. The scrambled eggs are astoundingly creamy and carry a cheesy taste to them. With buttery smooth fish and spiced avocado, the scrambled egg dish epitomizes the perfect breakfast. What I cannot figure out is how Dufresne achieves the cubic shape of the scrambled egg ravioli. Also, since the ravioli does not follow standard calcium alginate encapsulation methods, I do not know how Dufresne created such a distinct outer shell. If he merely cooked the outside of the cubes more than the inside so that the outside is hard, the hardness of the ravioli would be present in a gradient, shifting from hard to soft going inwards. That is not the case as shown in the picture. 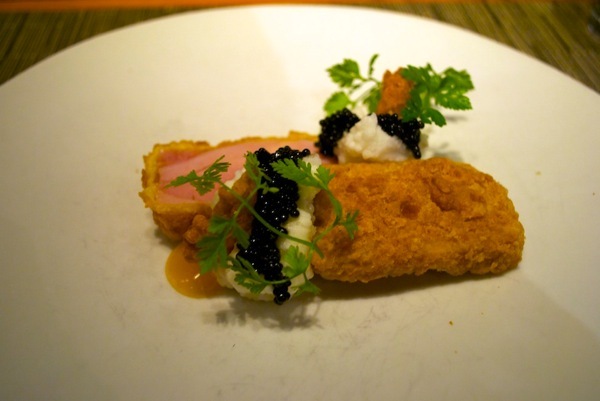 Paired with honey tabasco, ricotta, and caviar, the cold fried chicken was another favorite from the tasting menu. The chicken itself is very simple—fried then cooled to near freezing temperatures. The chicken meat appeared unnaturally pink and felt icy cold. Perhaps Dufresne uses dry ice or liquid nitrogen for the rapid cooling of fried chicken? The ricotta tasted like mashed potatoes, and the caviar was warm and juicy. 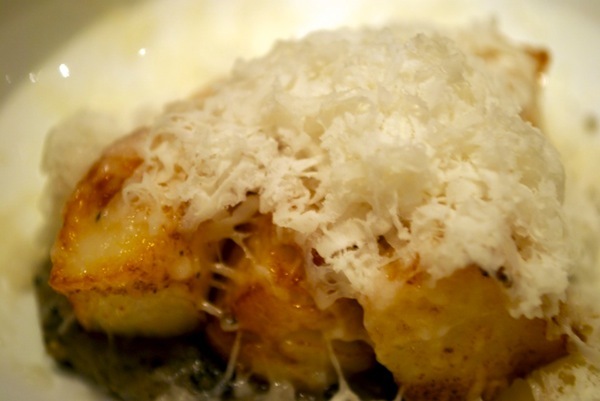 Overall, this dish was a great combination of various savory ingredients. Going into WD~50, I heard that the corned duck dish was a favorite, but I must disagree. Besides the hints of unique flavor from the sauces used in this dish, the corned duck appetizer is rather plain. The corned duck itself is also tough. The bay scallops dish paled in comparison to the others. The flavor combination was not ground-breaking, but the dish, nonetheless, satisfied my tastes. In this plate, a bed of ground sesame serves as a base for perfectly cooked scallops, and a sprinkle of frozen bone marrow covers the top. 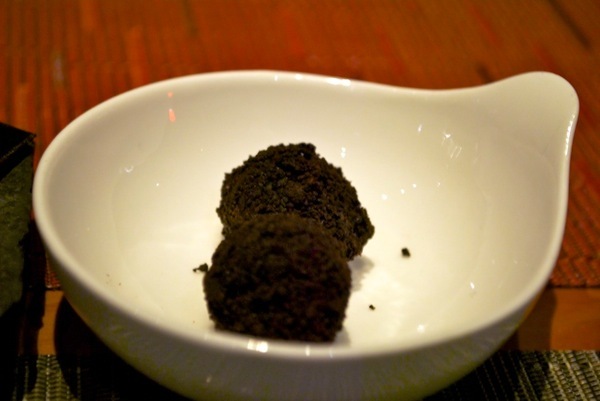 The frozen bone marrow harbored little taste, but the ground sesame base radiated a sweet, earth-like smell to it. While the top, frozen bone marrow, was cold, the dish progressively got warmer going towards the bottom. The noticeable difference between hot and cold in this dish served as an edgy surprise to an otherwise boring dish. The beef and bearnaise dish had the contrast of a light, delicate beef broth and a cheesy, creamy bearnaise. The dish does not actually have any beef in it—much to my dismay—but the flavors were wonderful. Dufresne’s beef broth is impeccable. The flavors are very pronounced while the clarity of the broth is superb. I loved the squab breast dish because there existed a plethora of flavors on the plate. With meat, cornbread, pumpkin pudding, and wilted chinese celery, the dish never lacked flavor. 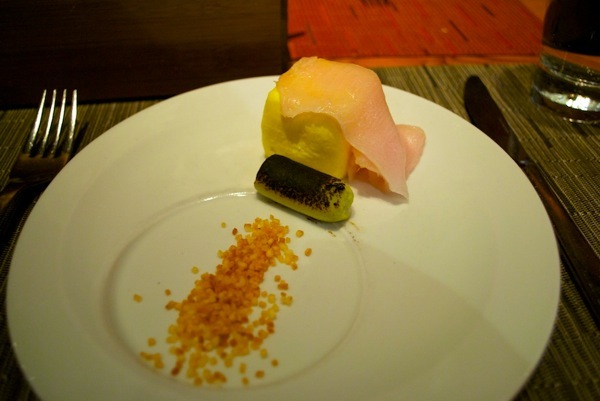 Initially, I stared at the dish, clueless of where to start. I wondered where the squab breast was and guessed that the faint red cylinder was a sausage made of squab breast, but with the stroke of my fork, I uncovered the squab breast! Hidden under some sort of sauce, the squab breast had a rare-cooked appearance. Cutting into the squab breast was difficult, and the breast was tough to chew, but the sweet flavors of pumpking pudding and cranberry jam-filled cornbread overshadowed these flaws. Again, this dish was very enjoyable to eat. The Wagyu flap steak is not normally on the tasting menu. Regardless, it was a nice addition and provided a sort of escape from the craziness of previous and upcoming dishes. 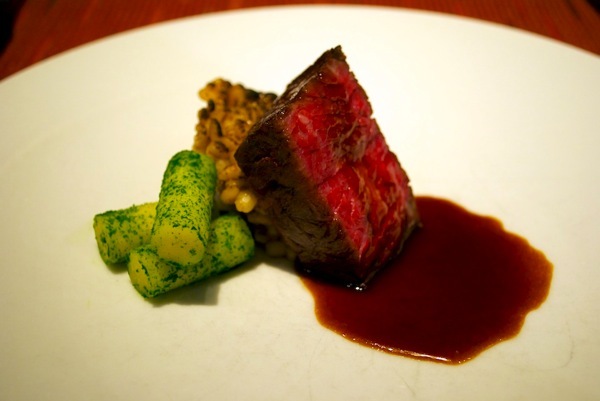 Consisting of steak, barley, and turnip, this dish is as close to a meat-and-potatoes dish as you will get at WD~50. The steak is cooked sous-vide and succulent. 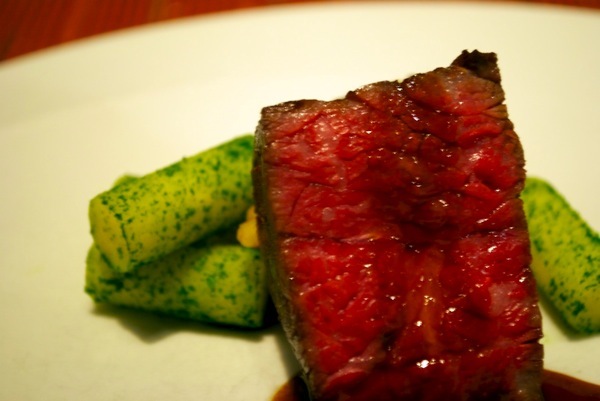 The sous-vide cooking method is molecular gastronomy related and has been around for a while. However, due to the scientific nature of the method, it is only utilized in high-end restaurants. 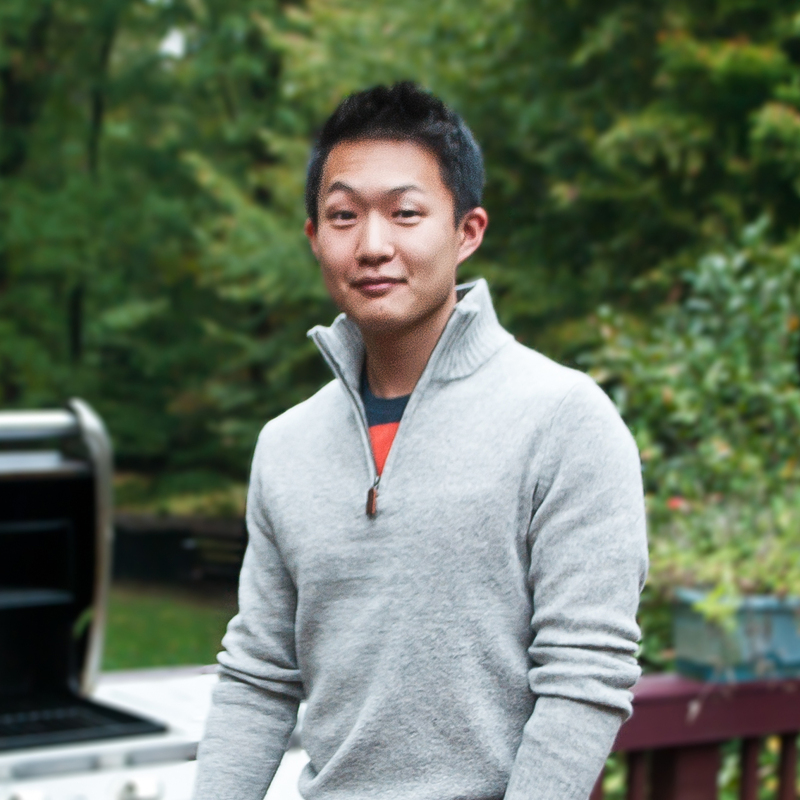 I’ll discuss sous-vide cooking in a future post. I loved the feel of this dish’s barley component. 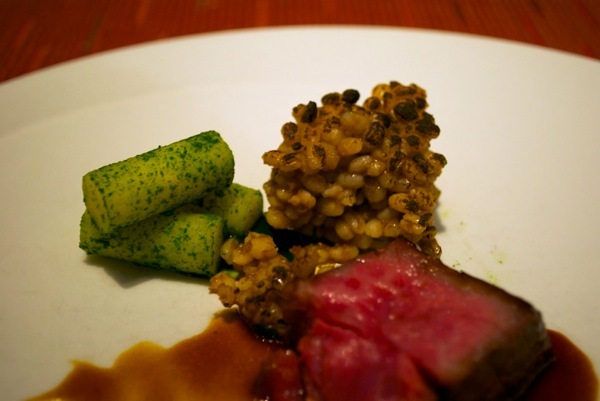 The chunk of barley carried a charred outer layer, but the barley itself felt like pasta cooked al dente. 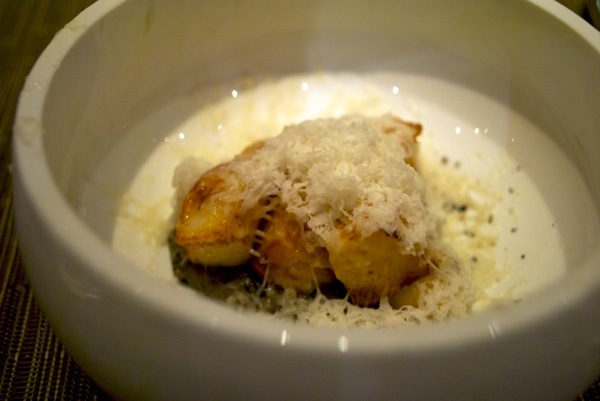 While the flavors in this dish were not mind blowing, the texture and simplicity of the dish make it appealing. 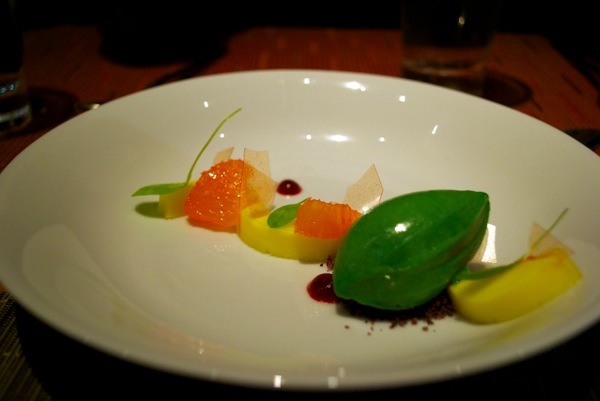 Beginning a slew of superb desserts, the white beer ice cream arrived in a tall oval-shaped bowl. 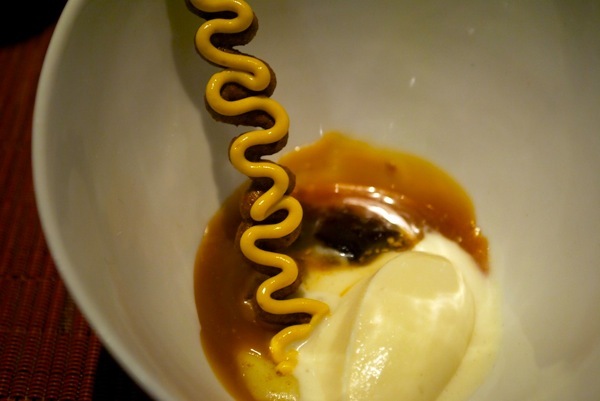 At the bottom lay caramel and white beer ice cream with a squigly graham cracker-like object stuck inside. Hints of savoriness can be found in this dessert, but the acerbic taste of white beer ice cream pairs well with the sweetness of caramel. 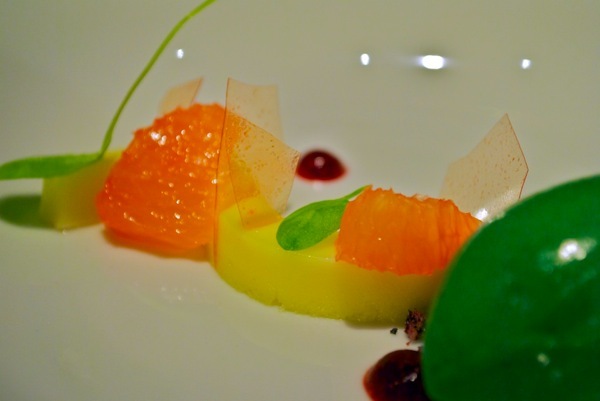 Contrary to the robust sweetness of the previous dish, the grapefruit curd dessert brought a plethora of fruity flavors. The green ice cream tasted wonderful and hit a perfect amount of sweetness. 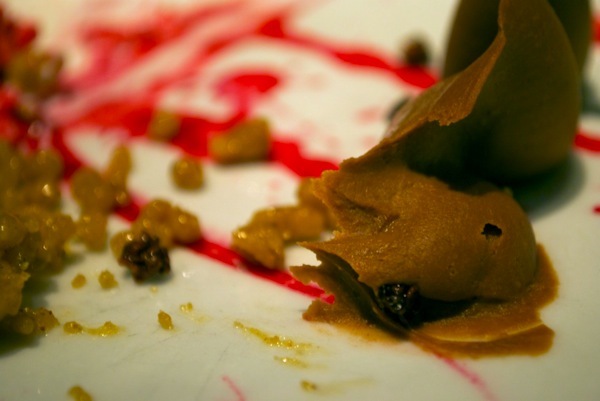 Unfortunately, I could not take any good pictures of the soft chocolate dish, but the presentation seems to model itself off of abstract art. I did not like this dish too much, but it did not, by any means, taste bad. 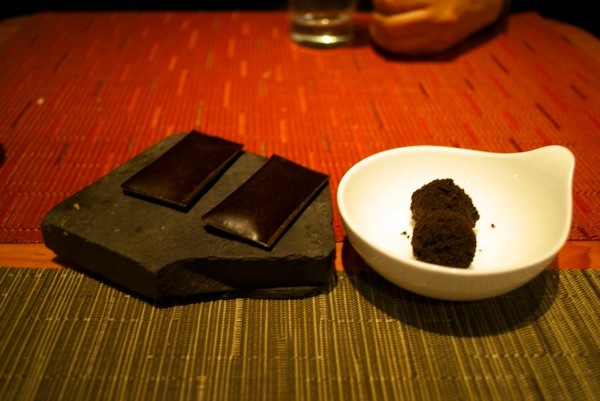 The final chocolate packet with milk ice cream covered in shortbread is a perfect finish to an exciting meal. While the ice cream covered in shortbread is sweet and delicious, the chocolate packets stole the show. At first touch, the rectangular brown squares feel inedible. They feel like a soft leather or some sort of material packaging. Of course, once you muster the courage to try biting onto one, your teeth struggle to clamp down on them. 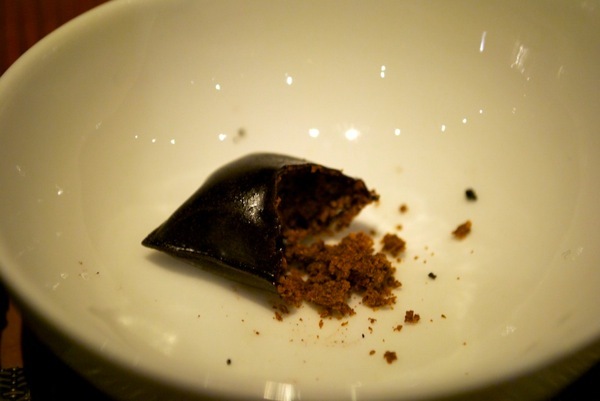 Still, the chocolate shell gives way to a air pocket inside half-filled with cocoa grounds—not exactly sure what they were. The entire experience feels surreal as chewing on the packets is a bit of a battle between teeth and some pliant, plastic-like sheet. WD~50 has a few healthy dishes and a lot of unhealthy dishes. 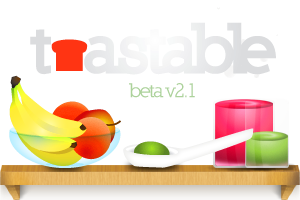 The scrambled egg ravioli dish has loads of protein, low amounts of carbohydrates, and little fats. The bay scallops dish has lots of protein and healthy fats. However, according to this Zagat article, the tasting menu consists of 2,465 calories, so WD~50 is not the place to go to eat light.